On 21 November 2017, WHO/Europe signed a new framework agreement for 2018–2022 with the Belgian Federal Public Service, Health, Food Chain Safety and Environment. 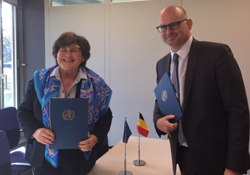 The agreement was signed by Dr Zsuzsanna Jakab, WHO Regional Director for Europe, and Mr Tom Auwers, President of the Management Board of the Belgian Federal Public Service, at a bilateral meeting in Geneva, Switzerland. Mr Marc Heirman, Counsellor for the Permanent Mission of Belgium to the United Nations in Geneva, also attended the meeting, which took place alongside a special session of the WHO Executive Board. These reflect the 5 strategic priorities included in the country cooperation strategy for 2016–2022, signed in November 2016.